Welcome to Neat & Tangled's July Release week! Danielle has designed some new bold sets to add the the Neat & Tangled family. :) Today we are featuring the set Everyday Circles. The bold solid stamps in this set are a perfect pairing with Hero Arts Shadow inks. I used this new set along with On The Strip 2 to create the circles. Be sure to check out the Neat & Tangled blog for more projects from the Design Team with this set. Also Danielle has a give away so be sure to comment for a chance to win over on the blog! I like how you've stamped the background of the circles. Nice! 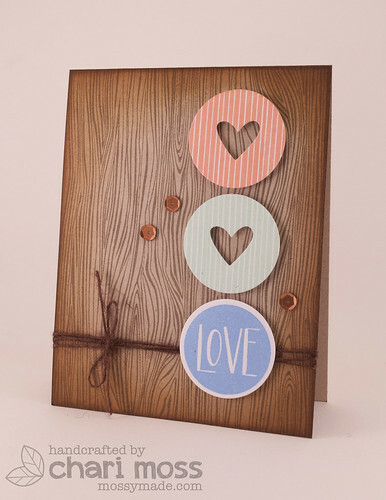 wow this is awesome.. totally loving the new release..
Love the stripy heart circles! love, love, love your hearts agains the woodgrain! oh wow!! love, love this! Love the new stamp and die set. Your card is so cool. I LOVE the woodgrain paper. No, I mean I SERIOUSLY LOVE that woodgrain paper. I love using circles on cards and layout! Love the design and those copper sequins is a must have! Need to go shopping! I am so excited to see the new releases! You made a very cute card! So love the CAS look and love that background paper! Cute card!